Roxli Doss is about one of the most happy-go-lucky kids you could ever wish to meet. At 11, Roxli is much like any other girl around her age, i.e., likes playing with her friends and riding horses. Until one day when she started experiencing bad headaches for the first time. Roxli’s life may have been unremarkable for the most part, but she liked it that way. The little girl took great pride in her hobby of horseback riding and always enjoyed hanging out and playing with her friends. Life was good but Roxli’s parents were concerned when she started to complain of migraine-like headaches that were affecting her daily. When the tests were completed and sent back from the lab, the surgeons’ worst fears were confirmed. Roxli was given the devastating news that she had a rare and inoperable brain tumor called “Diffuse Intrinsic Pontine Glioma,” or “DIPG” for short. Dr. Virginia Harrod with Dell Children’s Medical Center explained further. According to a Daily Mail report, Dr. Harrod said about Roxli’s case: “It is very rare, but when we see it, it is a devastating disease,” she said. “You have decreased ability to swallow, sometimes vision loss, decreased ability to talk, eventually difficulty with breathing.” The worst part about the disease is that there is no known cure. Not satisfied with just one doctor’s opinion, the Doss’s went to visit five different doctors across five different hospitals in the hope that the diagnosis was wrong. When all five doctors concurred with each other, the Doss family prayed even harder than before and started a fundraiser to raise cash for Roxli. 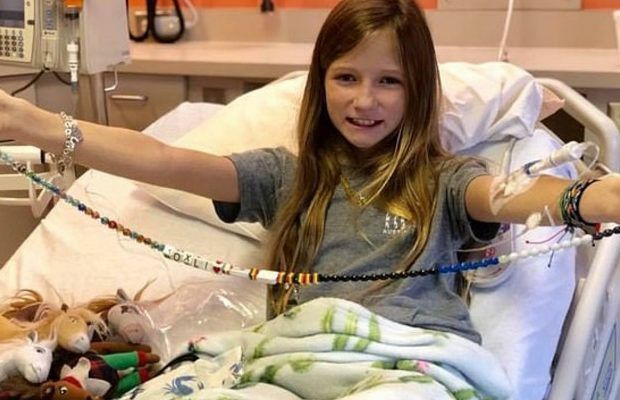 Roxli’s parents took her to the Texas Children’s Hospital in Austin, Dana-Farber Cancer Institute in Boston, Johns Hopkins Children’s Center in Baltimore and University of Texas MD Anderson Cancer Center in Houston to get other opinions. They were told that over time the tumor would grow and affect Roxli negatively. According to just about every doctor the family consulted with, Roxli’s heartbeat, breathing, swallowing, eyesight, and balance would decline steadily over time. Most people with this form of cancer live for roughly nine months following the primary diagnosis, but Roxli and her folks were ready to fight the battle. DIPG is extremely rare, affecting between 200-300 children in the US annually. The cancer is typically found in children aged five to nine, and Roxli was already a couple of years older than that threshold making her case even rarer. The cause is unknown, and doctors dread having to tell a parent that their child has DIPG. The tumor is inoperable due to being located at the base of the brain and at the top of the spine. The tumor presses on an area in the brain known as the pons which is responsible for some critical bodily functions such as breathing, sleeping and blood pressure. The initial symptoms associated with DIPG are worrying in themselves, and the Doss family knew there was something wrong with little Roxli. Issues like facial weakness and strange limb movements are also part of the package, and most kids with this condition don’t even make it long enough to undergo radiation treatment. Roxli was lucky that the tumor was located early on and immediately underwent radiation therapy. She needed to be in the hospital six days a week for six weeks to see if she would react well to the radiation. The Michael Mosier Foundation says that radiation shrinks DIPG tumors in 70 percent of patients. After six full weeks of radiation, despite the dire prognosis, Roxli was given an MRI and then went to visit her doctor, Dr. Harrod a few days later. “When I first saw Roxli’s MRI scan, it was actually unbelievable,” said Dr. Harrod. The tumor had totally disappeared and medical professionals, while ecstatic, were left scratching their heads in disbelief. While the spontaneous regression of some cancers is a common thing, it is extremely rare in the case of DIPG tumors. In an essay written by Dr. Momna Hejmadi, a senior teaching fellow in the department of biology and biochemistry at the University of Bath in the UK, immune response may well be the deciding factor in such cases. While Dr. Hejmadi believes that one reason for regression could be an immune response that the body triggers against antigens, a 1988 case report from Japan showed that a man with kidney cancer had part of the tumor removed by surgery causing the remainder of the tumor to spontaneously regress. For her part, Roxli made medical history as she is the first patient whose tumor was completely removed by radiation therapy. As this form of cancer is so aggressive, Roxli will need to have follow-up treatments and regular visits to the hospital to prevent new cancer cells from forming. Immunotherapy is the newest form of cancer treatment and is a type of treatment that redirects the body’s natural defenses in order to fight cancer specifically. While doctors have had some success with this form of treatment, in some patients the therapy redirects the body to attack itself and can lead to death. Doctors intend to give this form of therapy to Roxli in the hopes that it will prevent the cancer from returning. As religious people, Roxli’s parents said they have been praying and giving thanks to God for the way their daughter has recovered from her ordeal with cancer. “Every day we still say it. It’s kind of our family thing that God healed Roxli,” said Gena. Roxli’s dad, Scott also spoke about how thankful he is that daughter is doing well. “We didn’t know how long she would be healthy and, look at her, she’s just doing awesome,” Scott said. But he is still aware that Roxli isn’t fully out of the woods yet, and that’s where the GoFundMe page comes in.